The BFI have announced today that they will be releasing two of Jacques Tati's most beloved films, the 1949 Jour de fête and the 1958 Mon Oncle, as dual format editions (containing both Blu-ray and DVD versions of the films) with remastered transfers in October. 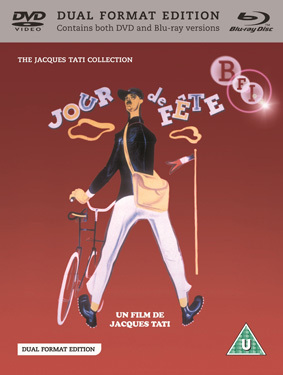 Jour de fête, an hilarious exposé of the modern obsession with speed and efficiency set amidst the rural surroundings of a tiny French village, was early evidence of Jacques Tati's unique talent and was internationally acclaimed as a comic masterpiece. Tati himself plays an appealingly self-deluded buffoon, François – a postman who, impressed by the bristling efficiency of the U.S. postal system, makes a misguided attempt to introduce modern methods in the depths of rural France. Initially released in black and white, but also shot in Thomsoncolor, an untested colour process at the time, the film was later restored and finally made available in its original delicate colour. Jour de fête was shot in the summer of 1947 in the little town of Sainte-Sévère-sur-Indre in the Berry region of central France. Tati's antics on his wayward bike are endlessly inventive and the film also serves as an affectionate, gently mocking tribute to a vanishing way of life. It was an expansion of the 15-minute short, L'Ecole des facteurs, that Tati had made the previous year, and almost all the gags in the short are brought into the longer film. Postman François' brief infatuation with 'American' methods of speed and efficiency prefigures the satire on modernity that Tati would go on develop in Mon Oncle (1958) and Playtime (1967), a previous BFI Dual Format Edition release. At first Jour de fête aroused little interest among French distributors. Not until after its London premiere in March 1949, when it got good reviews and went on general release, did the French industry sit up and take notice. It won a prize at the Venice Film Festival, and in 1950 was awarded the 'Grand Prix du cinéma français'. This new Dual Format Edition contains two versions of the film, both newly mastered to high definition; the 'Thomsoncolor' version which was first shown in 1995 and Tati's rarely-seen 1964 reworking of the original which features additional sequences, hand- painted details and English dialogue. Original 1949 colour version, first seen by audiences in 1995. Jacques Tati's second outing as the accident-prone Monsieur Hulot (first seen in Les Vacances de Monsieur Hulot, already available in a BFI Dual Format Edition) takes him to Paris where the aggressively high-tech lifestyle of his relatives, the Arpels, is contrasted with his old-fashioned ways in a scruffy part of town. Young Gérard Arpel is very fond of his gauche uncle but his disapproving parents resolve to get Hulot a job or a wife. The disastrous outcome is a masterpiece of design and symmetry and of technically brilliant gags. The heart-warming ending is true to Tati's vision of the modern world as a confusing place that is ultimately full of charm and humanity. Mon Oncle was a major hit and picked up a string of awards, including the Prix spécial du jury at Cannes, the New York Critics' Circle Award for Best Foreign Film and the 1959 Oscar for Best Foreign Film. Mon Oncle was shot between September 1956 and February 1957 at three different locations. The old Parisian suburb of Saint-Maur served for 'le vieux quartier', where Hulot's wonderfully ramshackle house was built into the town's main square. The Arpels' modernistic dwelling was constructed at the Victorine studios in Nice, and the wasteland between the two was shot at Créteil, a few miles outside Paris, where a new town was about to be built. 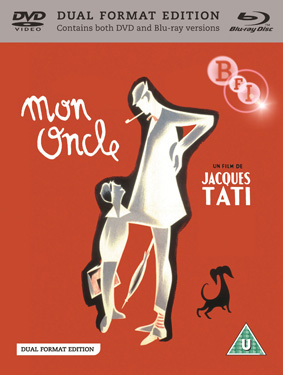 With an eye on the international market, and wishing to avoid subtitles, which he always disliked, Tati shot two versions of the film – Mon Oncle and My Uncle, the latter with signs like 'Ecole' and 'Sortie' replaced with their English equivalents and much of the main dialogue dubbed into English, but with some characters speaking French. Both films will be released on 22nd October 2012 by the BFI at the RRP of £19.99 each. UPDATE: The release date for both discs has changed to 29th October 2012.